In a few days, golf’s finest competitors will gather in Georgia to compete for honor, glory and a very handsome green blazer. Also, the Masters is this weekend. So we’ll just come out and say it: we think this could be your year. 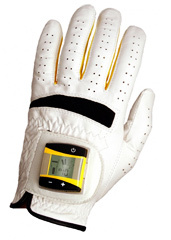 Introducing SensoGlove, a new electronic golf glove that can analyze your swing, now available online. So imagine your next round with Alice Cooper, Warren Buffett and Julian Schnabel (apparently they go to the same gym). You’ll find yourself lining up a chip shot, and your glove starts beeping. (Hearing Alice discuss stage makeup with Warren always makes you tense.) You’ll look down, and the screen will reveal the culprit—your ring finger is applying the death grip to your pitching wedge. You’ll take a deep breath, loosen up, try a few practice swings and step back to the ball. At some point, you may have to explain the beeping.